At his creative height in the 1980s, Terry Gilliam wrote and directed some of the dizziest, imaginative fantasies ever projected. He would mash up well-known myths, social satire, amazing (but cheap) special effects, the surreal comedy of Monty Python (he was, after all, their token Yank), and a busily baroque visual style all his own. His more recent works, such as The Zero Theorem, are a pale reflection of what he once could do. 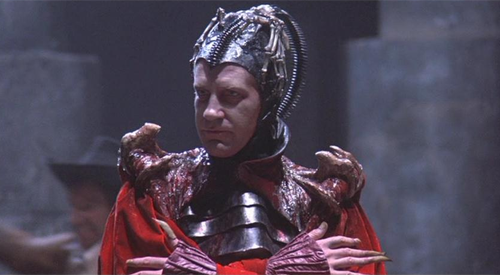 Time Bandits, briefly the top-grossing independent film ever, was his breakout hit. It came out as a bolt of merry lightning in 1981, reminding everyone who saw it that there was more to fantasy adventure than an endless stream of Star Wars and Conan rip-offs. Here was an irreverent tale of Robin Hood, Napoleon, Agamemnon, the Titanic, and the ultimate battle between God and Satan. Actually, in this movie they’re called the Supreme Being and Evil. The Supreme Being is played by Ralph Richardson as a fussy bureaucrat in a business suit. I doubt anyone else could have properly delivered a line like "I am the Supreme Being. I’m not entirely dim." David Warner, one of the great villains of the last half century, plays Evil with appropriate relish, in a costume and makeup that must have been great fun to design. He has henchmen, of course, obsequious yes men whom he blows up on a whim. Young Kevin (Craig Warnock), a wise boy with idiotic parents, accidentally finds himself travelling through time with six motley and generally inept robbers. They started their criminal careers by stealing a map from the Supreme Being that shows holes in the fabric of time and space. With this map in their hands, they can rob Napoleon (Ian Holm) and escape into Robin Hood’s Sherwood Forest. "Mr." Hood, by the way, is played by John Cleese as an insufferable and idiotic nobleman proud to be slumming with "the poor." The robbers, played by little people–including David Rappaport as their leader and Kenny Baker (AKA R2D2)–start off greedy and self-centered, and constantly arguing with each other. But as Evil (who wants to get his hands on that map) comes after them, they have to learn to care for each other, and for Kevin. 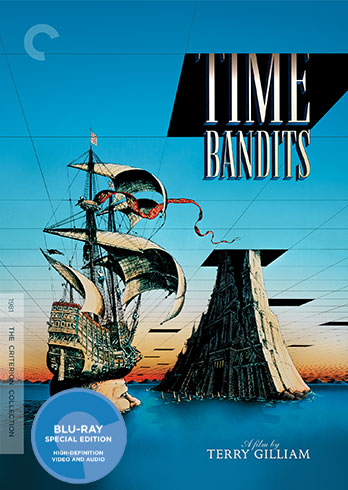 Time Bandits is a family movie, in the sense that children and adults can all enjoy it. But it’s too scary for very young children. I would say it’s fine for kid seven and up. But it’s not appropriate for parents who don’t want their children laughing at God. The disc comes in a thickish plastic case. The outer slipcover has a lenticular illustration that creates a 3D effect if you look at it straight on. Remove the slipcover and open the case, and you’ll find the disc and, instead of Criterion’s usual book, a fold-out copy of the map so important to the plot. On the other side you’ll find an essay by David Sterritt and credits for both the film and disc. The essay is alright, but there’s too much plot description and too much celebration, with too little real analysis. When you insert the disc, it displays the aforementioned map, with standard Criterion menu on the left. Like all Criterion Blu-ray discs, it has a timeline. You can bookmark any point in the movie. When you insert the disc for the second or third time, you’ll be asked if you want to go back to where you left off. Gilliam, with the help of Art Director Norman Garwood and cinematographer Peter Biziou, filled the frame with little details to delight the eye and create a sense of wonder. That’s part of Gilliam’s signature style. The better the resolution, the more you get to enjoy. Criterion’s 2K transfer, supervised by Gilliam, does justice to this busy image (yes, it probably would have looked even better in 4K). Details are sharp, and the film grain is visible but not distracting. In a couple of shots, the skin tones looked a little over-saturated, but I’m not sure that wasn’t intentional. Criterion offers the original Dolby Stereo mix as an uncompressed, PCM, 24-bit, two-track stereo mix. The only thing missing: They don’t tell you that this is a Dolby Surround mix. I don’t know why. So you have to know, on your own, to turn on the Surround or Surround Decode feature on your receiver. By the way, it sounds great. Commentary by Terry Gilliam and cast members: The various people who speak on this track, prepared in 1997 for the Criterion Laserdisc release, were recorded separately. You don’t get to hear them talking to each other. Gilliam does the lion’s share of the talking, while Craig Warnock (a young adult by 1997) adds quite a bit. So does Michael Palin, who in addition to acting co-wrote the screenplay with Gilliam. John Cleese and David Warner talk a bit about their small parts. Interesting and fun. Creating the Worlds of the Bandits: 23 minutes. HD. New. This documentary covers production and costume design, and tells the story of how the movie was shot, from the point of view of the designers. Terry Gilliam and (film scholar) Peter Von Bagh: 80 minutes. A conversation recorded in 1998 at the Midnight Sun Film Festival, just before a screening of Fear and Loathing in Las Vegas. 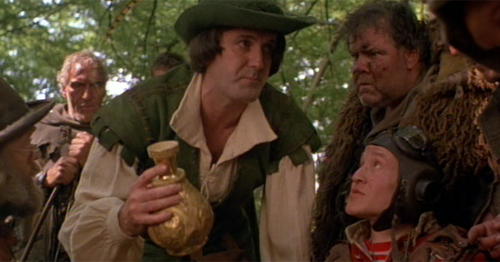 Gilliam recounts his life and career, with very little about Time Bandits. Shelley Duvall: 9 minutes. Excerpt from a 1981 episode of TV show Tomorrow, where Duvall is interviewed by Tom Snyder. Kind or ironic since she has such a small role. Still Gallery: Lots of behind the scenes photos. Didn’t go through all of it. Trailer: Very funny in a meta way. 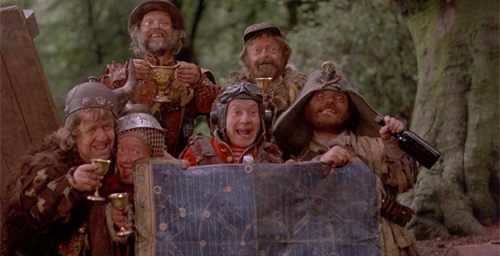 The Criterion Time Bandits Blu-ray disc goes on sale today.